Rinpoche is teaching on the 8 Verses of Thought Transformation at Tse Chen Ling in San Francisco, USA on November 15 and 16th. Rinpoche will teach at the annual Kopan November course, and will then continue his teachings based on the Kadampa lamas at Root Institute, Bodhgaya, India between Dec 26 – 31. Rinpoche will also give Gyalwa Gyatso initation during that time. Then Rinpoche goes to Delhi to attend the Dharma Celebration talk by His Holiness the Dalai Lama, hosted by Tushita Delhi on January 3rd 2004. Rinpoche then goes to Potowa Centre in Jakarta, Indonesia, and will teach and give Medicine Buddha and Vajrasattva initiations there. Next stop is Cham Tse Ling, Hongkong, Jan 12 – Feb 1st. Rinpoche will give Lion-Faced Dakini and a long life initiation, and will teach on Lama Tsongkhapa Guru Yoga. Rinpoche then goes to Shakyamuni Center, Taiwan, from Feb 4 – 8th. Rinpoche will then visit Naropa Centre, Tahiti for teachings on the 7 Point Mind Training, and to give Mitrugpa, Milarepa, Tara and Medicine Buddha initiations between March 10 – 17th. Then Rinpoche will teach at Dorje Chang Institute in New Zealand between March 19 – April 4th, on the Foundations of all Good Qualities, and will give Amitabha and Great Medicine Buddha initiations. Next is the Mahamudra retreat hosted by Buddha House, Australia between April 9 – May 4th. Rinpoche will give the Gyalwa Gyatso initiation at the beginning of the retreat. According to Rinpoche’s plans for this retreat, this will be an excellent opportunity for those who want to really understand meditation practice. Rinpoche will be in Mongolia for the EEC4, June 6 – July 4th. Then Rinpoche will teach and give Great Medicine Buddha initiation at Maitreya Instituut before CPMT 2004, August 27 – Sept 1st., and will give 21 Tara initiation during CPMT. Rinpoche will lead another long retreat – on Ganden Lha Gyema at Istituto Lama Tzong Khapa in Italy between Sept 3 – 30th. This will begin with Rinpoche giving Yamantaka initiation on September 4 and 5th. As we reported last update, Lama Osel is keen to ensure that his Western studies are on par with his peers, and to a standard which will, if necessary, qualify Lama for University entrance. After several months of private tuition in Spain, Lama decided that he would like to spend time in a good quality boarding school. After a lot of research and several interviews, Lama was accepted into an elite boarding school considered to be one of the top 3 schools in the country. The school is renowned for academic excellence and the development of enquiry, leadership, and personal qualities, and as Lama insisted should be the case, is not too religious, and has great emphasis on sport and other activities. The school is modeled on a traditional English boarding school. There is strict discipline, students wear uniforms, and are not allowed out of school except at weekends and then only with written permission. There are about 1,000 students from all over the world, which gives the campus a truly international atmosphere. Lama’s immediate objective is to achieve high school graduation and to develop in sports and other areas of personal and social growth and development. The staff are extraordinarily helpful and have tailored a curriculum that will accommodate Lama’s particular study needs. So far Lama appears extremely happy with this new situation and has commented that the staff are exceptional and the students highly intelligent. Lama is having to work hard to catch up on some subjects and to keep up in others. Lama’s mid term reports are good and his teachers are pleased with his progress so far. The ceiling has 1000 colored icicle lights the entire length, and then on the 2 long beams that run the length of the room there are garlands of lights, two 7ft high light Christmas trees sparkling and numerous other light offerings, in all there are about 3000 light offerings, and the walls are lined with altars with now over 350 large water bowls. Above the staircase there is a giant relic table, full of the Buddha’s relics, stupa tsa tsas, pictures of Buddhas and deities, and the entire Kangyur and Tengyur (in CD form) as well as many CD’s of lungs, teachings, the Prajnaparamita (8000 verses) lined in pure gold, so the entire table is full of holy objects. In between Rinpoche’s retreat he is painting a Tara photo, tsa tsas, offering jewels in the form of sparkly glue on stupas and making small animals (yak, goat and sheep) out of molding clay that are needed for incense pujas. 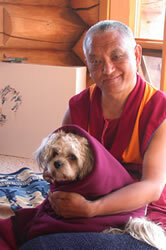 We had a brief visit from one Lhasa Apso who lived with Rinpoche for one week (until his owner made contact). We found him lost in the local Wal-Mart car park, he was quite scared of us but as soon as he saw Rinpoche he went straight over and sat at the head of the table with Rinpoche. Rinpoche offered Jangsem (his temporary name) his own fleece blanket. Each day he was here Rinpoche ran with Jangsem – picture Rinpoche hiking up his shemtab and dog running full speed with ears flapping…Rinpoche laughing so hard. Rinpoche seems extremely relaxed going from one holy activity to another. The house has many, many insects such as hornets and beetles that we all collect in jars and Rinpoche jogs (for exercise) around the relic table 8-10 times before releasing them outside (except now it is snowing outside so Rinpoche has made a house in a box for the insects as he is worried they will die if they go out in the cold). Rinpoche has now picked the site where he would like to build a 30-35 ft high Namgyalma stupa for his Gurus’ long lives. Rinpoche wants it on the mountain so that it can be clearly seen by people driving by at the foot of the mountain. It will also have a small gompa underneath. There are texts open everywhere, on all spaces and art projects happening, Roger has the tormas going, John (Ven John Jackson) is painting tsa tsas, Rinpoche is painting tsa tsas, Chosang (Ven Lhundrup Chosang) is framing Buddhas and cooking and there is silence and unbelievable sunsets…………. Yesterday was the first snow and while doing the Dzambala offering outside (at midnight before lunch!!) in gale winds and snow, one single Tibetan page (laminated) got swept away in the wind and flew off. The next morning we spent about an hour searching for this single piece of paper, Rinpoche insisting he was warm though only wearing a thin zen, while we were wrapped up to our eyes in jackets and hats. One day Rinpoche came down to the kitchen and made everyone a snack of fried portabella mushrooms in massive amounts of butter and salt and Rinpoche named the snack Buddha Amitabha’s snack and then proceeded to name the house Buddha Amitabha Pure Land . Rinpoche’s vision for this retreat house and land is for some students when they get old to build retreat houses on the land and to live and do practice until they die. There are some lovely new photos of Rinpoche on the website – just go to https://fpmt.org/teachers/zopa/gallery/ to enjoy them. There are two photos of Rinpoche with Kirti Tsenshab Rinpoche during Kirti Tsenshab Rinpoche’s teachings at Land of Medicine Buddha and Vajrapani. Also Rinpoche visited International Office during His stay in Taos, and we have some very nice photos of that. You will see two photos taken while Peter Kedge, CEO of the Maitreya Project, visited Rinpoche. The story behind the balloons is that recently while Rinpoche was at his house in Aptos, nearly every day Rinpoche would write prayers and mantras for the whole of FPMT and Maitreya Project on these massive balloons, then Rinpoche would release them in the sky…while doing an incense puja. Rinpoche said these balloons were the same as putting up prayer flags.